How to Choose Wedding Accessories for the Bride - Be Glossy In and Out! A wedding is one of the most significant events in life of two hearts in love. Every bride wants to create her own irresistible image – you actually can do this with a help of a beautiful dress, hair style, makeup, as well as with some wedding accessories. 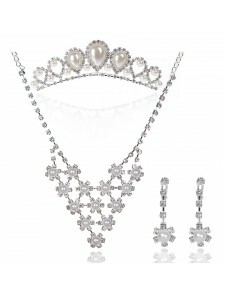 Jewelries should emphasize the bride’s elegance but not overshadow her natural beauty. That’s why when choosing a necklace, bracelet, earrings you better stick to some certain rules. A necklace should profitably emphasize the décolleté cut of your wedding dress. A V-shape cut is regarded the most problematic one and requires an accessory that would perfectly replicate the décolleté form. The best option is a long pendant on a thin chain or a necklace tightly clinging to it. A dress with uncovered shoulders allows any form of a necklace: beginning with elegant chainlets and ending with massive jewelleries. A U-shape dress should be completed with a short jewelry of a semicircular shape, velvet or “collar” necklace. You should not add any jewelry to wedding dresses with an asymmetrical neckline or a stand-up collar. The maximum thing you can afford here is to put on a bracelet and some earrings. Note that beads, necklace or choker should be elegant, even sophisticated. Too massive jewelry are not really welcomed: they can spoil the entire impression even if you have an extremely exquisite attire. Perfect wedding earrings traditionally emphasize the bride’s tenderness and femininity, completing her finery and hair style. Massive earrings are not recommended to be worn by the delicate and fragile brides, while at the same time they can be a perfect option for those girls who are not so thin. A round or wide face can be visually extended with a help of long earrings, while for a narrow face you should better choose some earrings of a convex or rounded type. A lengthened earring form fits well to the high and complex hair styles but if you have loose hair at your wedding, some small diamond earrings resembling dewdrops will be absolutely attractive and suitable. A bracelet must be not large; it should have identical decorations as necklace and earrings. It’s better not to put on the bracelet if your wedding dress has long sleeves or you are going to wear gloves. 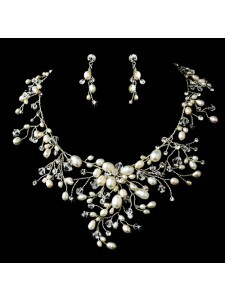 Such jewelry will be more appropriate with a plain and open dress. Wedding rings are the main jewelries at a wedding ceremony of two people in love. In ancient times, a wedding ring used to symbolize fidelity, love and purity. Nowadays, in modern bijouterie fashion, jewelries made of several precious metals and stones are regarded the most popular ones. One more zest that will perfectly emphasize the exclusiveness of a wedding ring is etching on it. When choosing wedding accessories, you should rely not only on your own taste but also on some advice from the professional jewelers - they can help you create a wonderful image of a queen of the ball and make your wedding feast as magnificent as in a fairy-tale. Δύσκολη η επιλογή των κατάλληλων αξεσουάρ, οπότε δεν είναι κακό να ζητάμε τη γνώμη των ειδικών!